Tilney St. Lawrence Fen End postmill stood close to the chapel on the south side of the village. The mill buck stood on a roundhouse and was turned to wind by a left handed 6 bladed fantail on the ladder, the original tailpole having been cut off. Power was supplied by four single shuttered patent sails - the inner pair had 6 bays of 4 shutters and the outer pair had 4 bays of 4 shutters and 3 bays of 3 shutters. Two pairs of stones were set in the breast of the mill, the left hand pair were French burr stones and the right hand pair were Peak stones. A bakehouse was run on the premises. 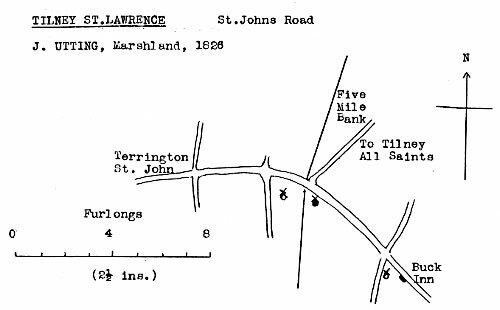 A new built Dwelling house with an excellent WINDMILL, Stable and other Buildings and a piece of Land adjoining in Tilney St. Lawrence next the turnpike road leading from Lynn to Wisbech , now in the occupation of Mr. Sutterby. Possession will be given on the 11th October next. Apply to Mr. John Barsham of Fincham or Messrs. Jarvis, Solrs. Lynn. Lot 1. All that Messuage or Dwelling house and Wind Corn Mill with the Barn, Stable and Granary, Bakehouse and Outbuildings and 5a. 1r. 0p. (more or less) of excellent Land lying under the same abutting upon the Turnpike Road leading from Lynn to Wisbech north and upon the Smeeth Road west and now in the occupation of Richard Sutterby. Lot 2. A Messuage and Shop near the above with the Yard and Garden abutting upon the Turnpike Road and now in the occupation of J. Goodwin. The Sales to be completed on the 6th April next. Particulars on application to Mr. Dobbs. Walsoken, Mr. Dobbs, jnr. West Walton or to Mr. T. S. Watson or Mr. Edward Jackson, Solrs. Wisbech. To be Sold by Auction by Messrs. Squires and Green at the Bell Inn, Wisbech on 27 January inst. In Tilney St. Lawrence, Norfolk. Various Estates. Lot 1. All that messuage or dwelling house and Wind Corn Mill, with the Barn, Stable and Granary, Bakehouse and Outbuildings and 5a. 1r. 0p. (more or less) of excellent Land lying under the same, abutting upon the Turnpike Road leading from Lynn to Wisbech north and upon the Smeeth Road west and now in the occupation of Richard Sutterby. Lot 2. A Messuage and Shop near the above, with the yard and garden abutting upon the Turnpike Road north, and now in the occupation of J. Goodwin. Wanted immediately, a steady active Young Man of good character. Apply D. Clifton, Tilney Fen Mill, near Lynn, Norfolk. To be sold by Private Contract with possession at Michaelmas. A Capital corn WINDMILL driving two pairs of stones, with patent sails, strong works and brick ROUNDHOUSE capable of containing 1000 sacks of flour. Also an excellent Baking Office with a good Oven and Drying House and every convenience for trade. Also a substantial and well built Dwelling House with cart lodge, stables, piggeries and garden and Three Acres (more or less) of pasture and arable land adjoining the said premises. Apply to Mr. I. O. Smetham, Solr. Kings Lynn. Wanted, a man to assist in both branches. Apply to J. Shepherd, Tilney St. Lawrence. FOR SALE, a strong useful Cob, 5 years old, 14½ h.h. sound and quiet. Apply to R. Fordham, Tilney St. Lawrence. At Terrington St John, Fen End, a wooden post windmill, working on a pivot, was tilted over by the wind and wrecked, the occupier, Isaac Stacey, farmer and miller who was grinding corn at the time being killed on the spot by the ruins of the mill falling upon him. 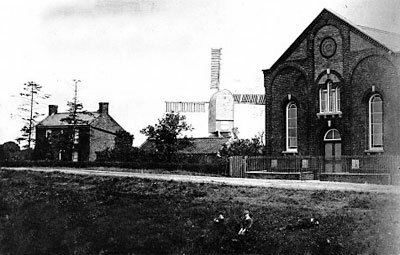 The Post Mill at Tilney Fen End which was owned by my Father was struck by lightning on Feb. 22nd in 1908 when my father was killed by lightning as my father was standing near the mill ready to aid the Fan tackle in case the wind changed. The Fan tackle travelled round the mill on a wood surface and if the wood was wet or slippery it was necessary to sprinkle ashes for the wheels to travel so that the Sails was kept Facing in the Wind. There were times when a very strong wind would cease for a brief Period and then blow from the opposite direction and that would cause the mill to be tailwinded that was why my Father was there to help and see that the Fan Tackle needed the ashes for the Fan Tackle to travel quickly. Then the lightning struck the mill and my Father was killed by the lightning. My brother Harry was up in the mill and came down in the mill but was not Hurt in any way. I was in the yard feeding the cows and the cows were so terrified they went round the yard in such a way indescrible.